UV luminous ink contact lenses are same as the myopic contact lenses on the appearance, while the color of invisible ink contact lenses cheating is darker. Using a invisible ink marked cards deck with this poker contact lens, you can clearly read all hands on the poker table. If you buy marked cards contact lenses, you also need to use with luminous ink marked playing cards (buy form us directly or mark cards yourself with invisible ink pen). Then you can randomly enjoy your poker game. 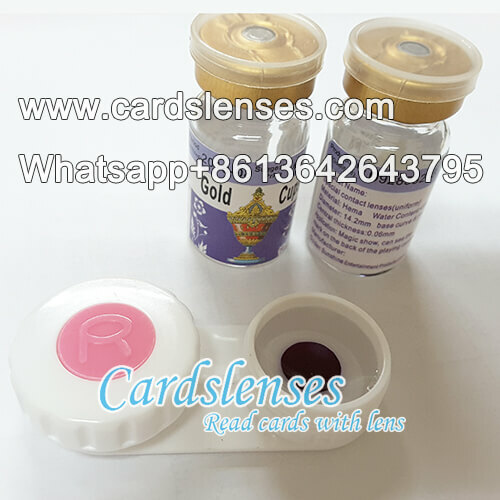 This oxygenous invisible ink UV contact lens for playing cards is suitable for any eyes and offers a good effect while the naked eyes can not find any flaws. Ultraviolet invisible ink glasses also can identify the luminous marked cards, but just as a detected filter, while the concealment ultraviolet contact lenses for marked playing cards are more safety and convenient.